The Bingham Business Club presented our chairman, John North with a cheque for £200 which will enable us to start preliminary work on our planned heritage panels. 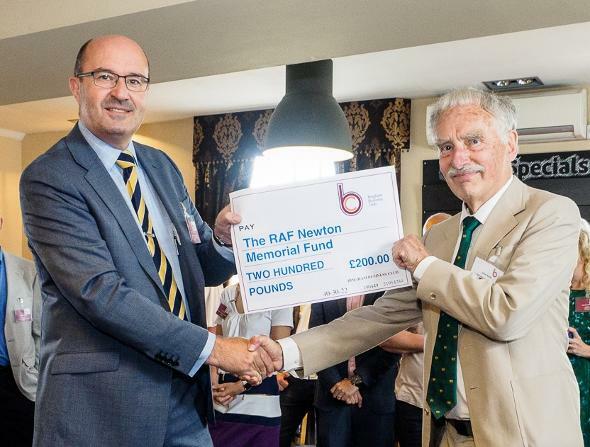 The RAF Newton Mmeorial Fund was one of five local community groups to receive a cheque. The photo below, taken by Malcolm Sales is of the Club Chairman, Jonathan Hammond presenting our Chairman, John North with the award. 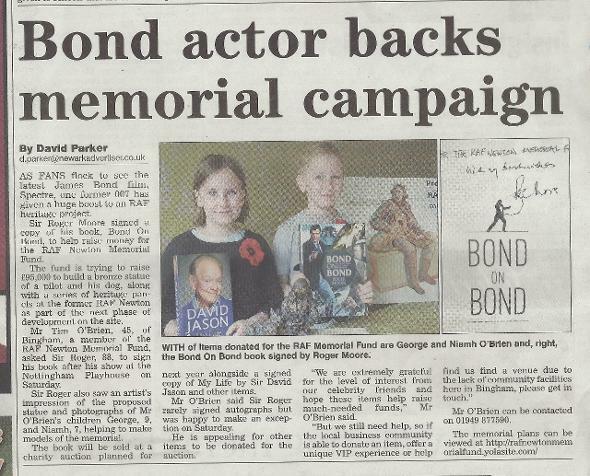 Former Bond actor, Sir Roger Moore got to hear about how two local school-children have been involved with the memorial by making models and helping to promote it at local fairs and kindly donated a signed book for us to raise funds at a planned charity auction. Others items we have recently collected include a signed book by Sir David Jason. Unfortunately we have had to cancel our fund-raising event for the 20th, due to circumstances beyond our control. In short, the pub landlords left without telling anyone and when we visited a few days beforehand to check final details for our event we found a very empty pub! 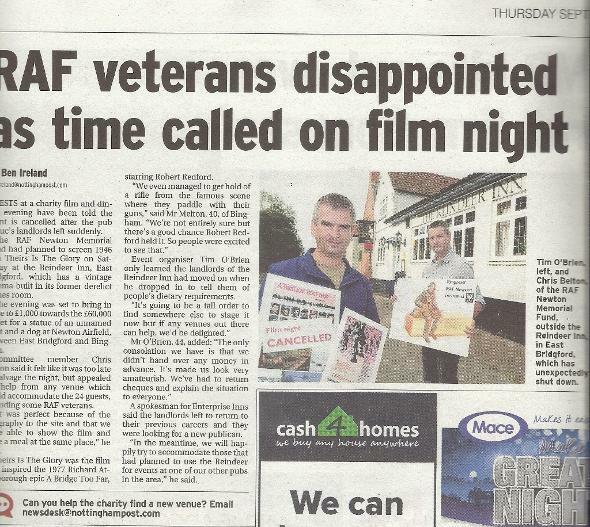 We raised over £900 at our D-Day+1 event last night. 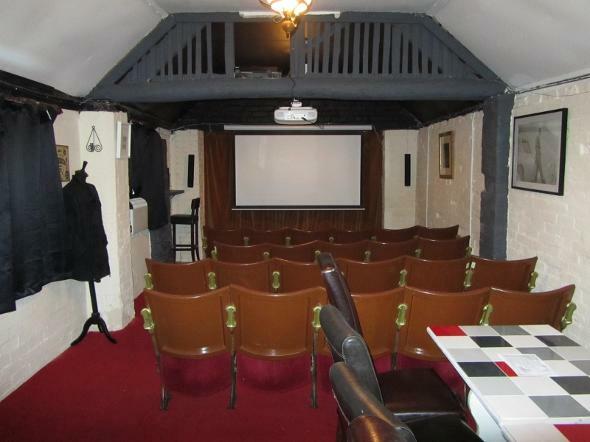 Guests enjoyed a fish and chip supper, followed by the film OVERLORD (1975) in the small cinema. We look forward to the next event on 20th September which commemorates the 70th Anniversary of the battle of Arnhem. We started advertising our latest fund raising venture. Our first meeting of 2014. We are meeting to discuss the new designs, our public consultation and various fund-raising activities. The committee met again after a summer recess and discussed three new designs. 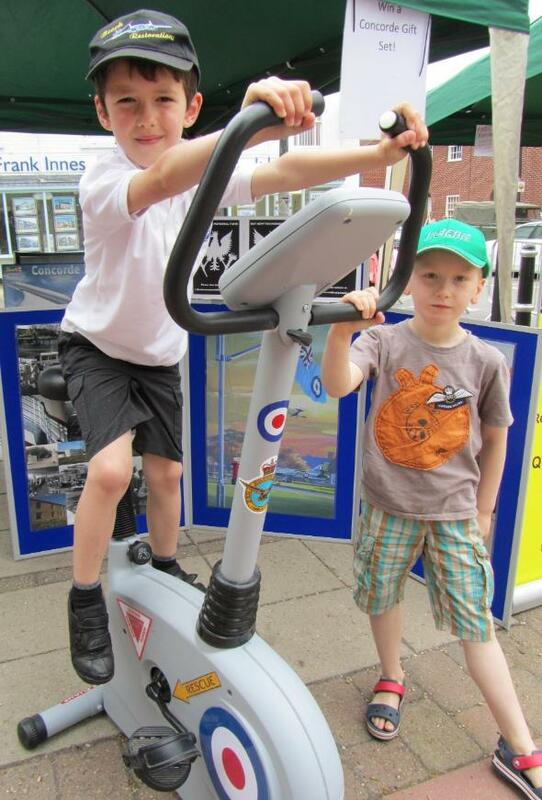 A huge thank-you to every who supported our stall at the fair and well done to the winner from Grantham who won a model kit of Concorde in our cycling competition. Avro Lancaster PA474 made a low pass near RAF Newton en-route to Donnington. The second Annual General Meeting was held today. 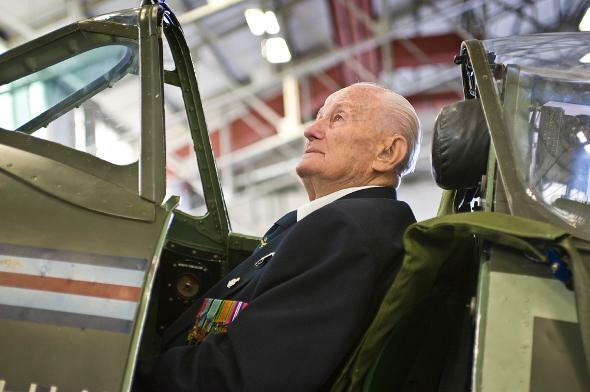 Our friend Jozef Warchal, a Polish fighter pilot with 303 and 304 Squadrons, who also served as an instructor at RAF Newton from 1942 to 1945 sadly passed away at the Queen's Medical Centre, Nottingham on December 22nd 2012 at the age of 96. He followed our memorial project with great interest and will be sadly missed by all. Apart from raising more funds this year, we have just caught up with a news story in the Nottingham Post that the next development phase has passed the outline planning stage and that the memorial is highlighted on the plans, which is great news - at least the project hasn't fallen off the plans! We discussed potential fund-raising ideas for 2013. We held our first AGM tonight at the HQ of 1936 Newton Sqn ATC. Several committee members manned a stall at the East Bridgford Horticultural Show and sold various collectables to raise funds and awareness for the project. 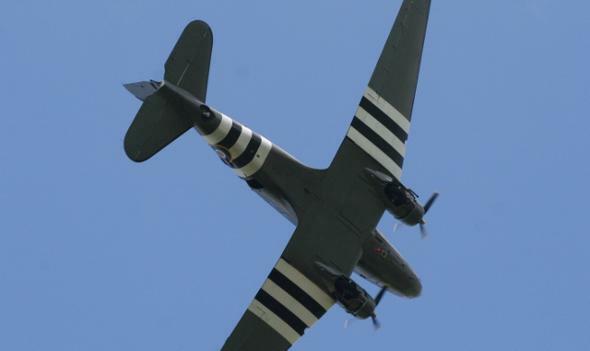 The highlight was a flypast by the BBMF Dakota at 2pm. 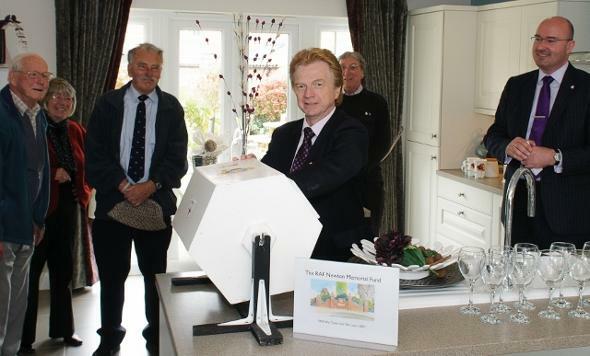 The winning tickets were drawn at 12 noon by Cllr Neil Clarke (centre), the Leader of Rushcliffe Borough Council at David Wilson Home's 'Newton Park' Showhome which is on the site of the Airmen's Mess. Neil commented "It's a fantastic project that means the history of RAF Newton will be remembered and I am thrilled to be part of the day." Sheila of DWHs Showhome team is on the left and Tim O'Brien is right, holding the tumbler. A full list of prize-winners appears on our raffle page. Photograph by Malcolm Sales of Buttercross Photography, Bingham. Tim O'Brien will give a talk about the RAF Newton Memorial Fund to the Bingham Business Club at their breakfast meeting at the Horse and Plough in Bingham and promote the Tiger Moth Grand Draw at the same time. Our Tiger Moth Grand Draw features in the following parish magazines which are distributed to every household in that parish - Radcliffe LINK, Keyworth, Burton Joyce and on the Cotgrave village website. 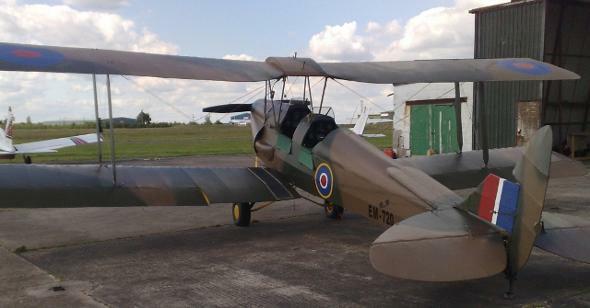 The Tiger Moth Grand Draw was featured in Andy Smart's Bygones feature in today's edition. Please come and see our exhibition in Bingham Library which highlights the history of RAF Newton and the proposed memorial. Tim O'Brien was interviewed today for Bingham's Audio Magazine to promote the Tiger Moth Grand Draw and the proposed memorial. The audio magazine is designed for elderly residents and those with impaired vision and restricted mobility. It is available as a CD. The Bingham Advertiser published a large article to highlight how we have been forced to re-think our design and potential location due to a lack of communication with the planning consultants who are working on the outline planning for phase two of the next development; plus the article mentioned the Tiger Moth Grand Draw. It was announced today in the Bingham Advertiser that Bingham Town Council have awarded the fund £500 as part of their community grant scheme. Tim O'Brien gave a history talk about RAF Newton to the Elston (Pentagon) History Society and highlighted the proposed memorial. 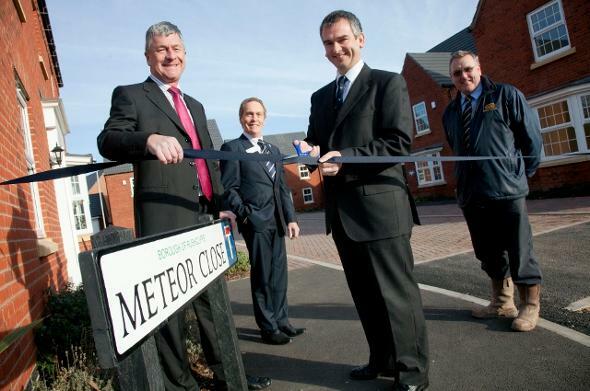 Artist and author, Tim O'Brien was invited by David Wilson Homes to cut the ribbon to the first completed road in Newton Park - Meteor Close named after the Gloster Meteor flown by 12 Group HQ Comms Flight in the 1950s. DWH made a generous donation of £100 to the memorial fund as a thank you. DWHs Sales Director, Philip Lacey (far left), Keyth Andrews (right), Tim (left) and the site manager, Kevin Richardson (far right). Photograph via DWH/Unsworth Sugden. Tim O'Brien gave one of his history talks about RAF Newton to the ladies (and a few gents) of the Epperstone branch of the Women's Institute and highlighted the proposed memorial. We end the year on a high by breaking the £2000 mark in pledged donations (as we have yet to recieve some donations/grants), which the committee feel is a tremendous achievement since we formed seven months ago. We wish all our supporters a happy christmas and new year. Just received this free journal through the letterbox and see the A46 'Highway Hobble' features on the front and inside page giving great news coverage for the memorial fund. A big thank you to the 62 supporters who cast their vote in our favour as part of the NatWest Community Award Scheme, which had a top prize of £6000 which we would have used towards the production of the metal eagle sculpture and unit badges. Unfortunately our 62 votes were not sufficient compared to one 'inner-city' project that attracted 190+ votes. Oh well, next year perhaps we'll have more luck! Children Raise Money by Running Along the A46 Fosse Road!!! The O'Brien family of Bingham, Notts completed their 6 mile 'Hobble' along an unopened stretch of A46 between Syerston and Farndon today. Julie O'Brien who raised the sponsorship would like to thank everyone who has already sent and those who have pledged sponsorship. Her husband and two young children took part aswell to give her support. The O'Brien's were even seen on BBC East Midlands Today who were covering the event. 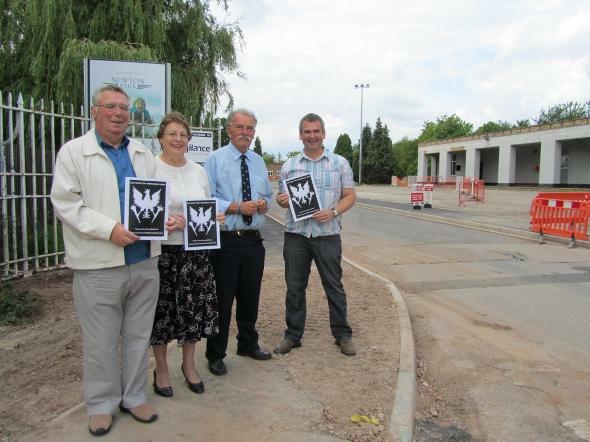 A46 Highway Hobble - Last Plea for Sponsorship! On Sunday 16th October, we have a participant taking part in the sponsored 'Highway Hobble' along a newly completed 6 mile stretch of the A46 between Elston and Farndon before it opens in a few months time. She needs sponsorship - if you would like to pledge a donation, please phone 0784 007 6178 to discuss. Or post your sponsorship to The RAF Newton Memorial Fund, c/o 5 King's Sconce Avenue, Newark, Notts, NG24 1FX. Another committee meeting was held after our summer break. Tonight, committee member and headteacher Chris Belton spoke about his very successful campaign to purchase a Shorts 360 aeroplane for use as an outdoor classroom at his primary school in Colwick. A follow-up news item about the funds launch and donations is on page 7 of the Bingham Advertiser. During the event, DWH/Bellway pledged a contribution to start the fund. Sid Adcock also made the very kind gesture of donating his expenses fee. Other generous members of the public also made cash donations. The website has now been published and has been well recieved by supporters. The committee met for the second time to discuss progress with the website that is being designed by one of the committee members, while the Chairman, Secretary and Treasurer completed application forms to open the RAF Newton Memorial Fund bank account with the Bingham branch of the NatWest the following day. After several months of informal discussions between six individuals who all have a personal connection with RAF Newton (mainly ex-Air Training Corps and/or had a close relative serve at Newton), decided to form the RAF Newton Memorial Committee tonight after agreeing our constitution. The venue for the meeting was the headquarters of 1936 Newton Squadron, Air Training Corps, Trenchard Close, Newton, whose OC has kindly allowed the committee to use on a non-parade night.